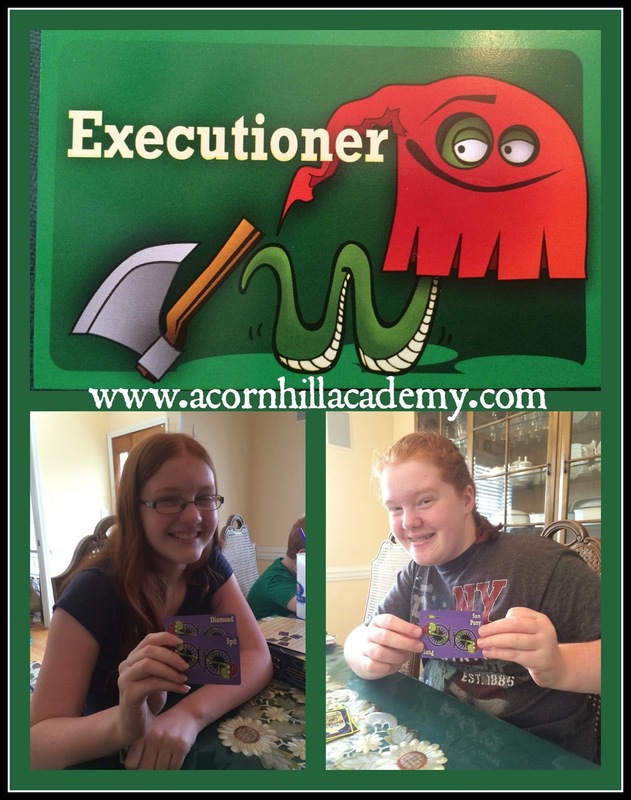 Acorn Hill Academy: You Will Love This Game! You Will Love This Game! Our family loves to play games. We have such a good time together! It's a great way to connect, and we're always looking for a new game to try. 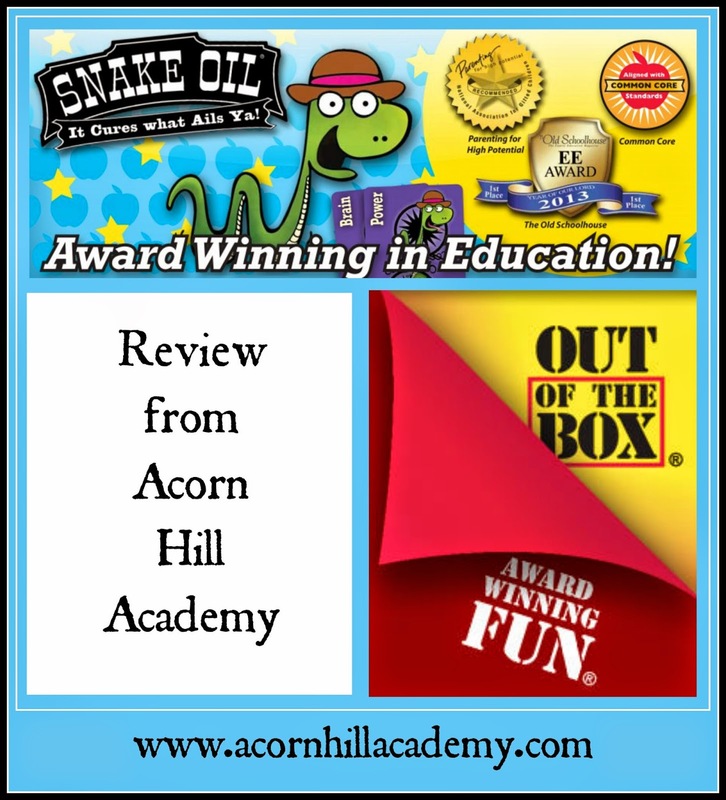 We were recently given the opportunity to review the game Snake Oil from Out of the Box Games, through the Schoolhouse Review Crew. This game, intended for ages 10 and up, is simple to play. You need at least three players: one to be the Customer, and the others to come up with products to sell. The Customer chooses a customer card, which tells you to whom you are selling. Each player gets six word cards, and when it's your turn to sell, you combine two word cards into your product, and then market it to the Customer. The Customer chooses the product they feel will best suit them, and the winning salesperson collects the Customer Card. The player with the most customer cards at the end of the game wins. Each game takes 20-30 minutes, depending on how many people are playing; when I played with my two girls, I think our playing times were shorter than that. My younger daughter was the second Customer, and she was Santa! 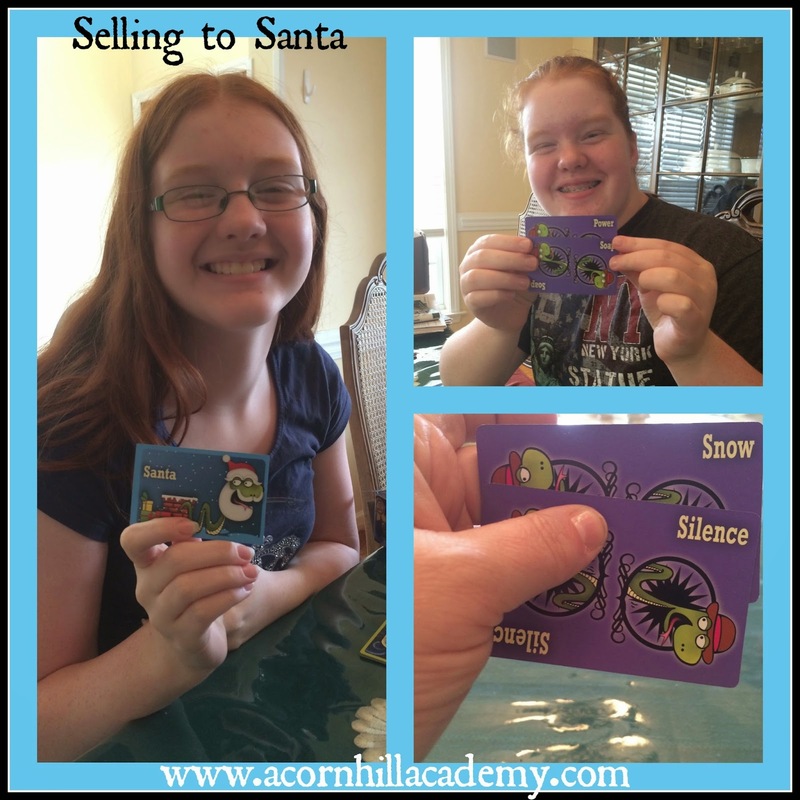 I tried to sell her Snow Silence, so no one would hear her coming, and my older daughter tried to sell her Power Soap, for a refreshing burst of energy before heading out for a long night of delivering gifts and climbing up and down chimneys. Not only is Snake Oil fun, it inspires some creative learning. You have to be able to think quickly and be flexible enough to work with whatever comes up. Also, even if you have the best card combination for a "product" that will suit your "customer," if you can't market it well, you will lose. Communication skills are important, too, because even if you think the product you came up with is a bit ridiculous, you still have to make your "customer" want to buy it. My girls and I had a blast playing this game, and we agreed that it would have been even more fun with more players. If you're looking for a great game to add to your family collection for Christmas, or to give as a gift, check out Snake Oil (19.99)! If you have younger children, consider Snake Oil - Party Potion for ages 8 and up (14.99). In addition to these great party games, Out of the Box Games has some classroom games that look fantastic (most only need 2 players; one game needs 3 to start) and helpful information for educators. Connect with Out of the Box Games on Facebook, Twitter and YouTube! A New Book for Christmas!